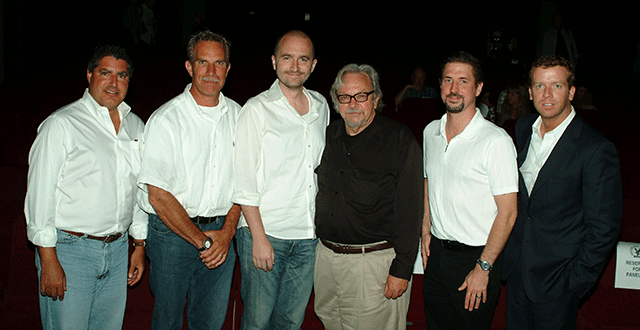 The Film Foundation hosted a panel discussion on “The Future of the Future: What’s Next in Digital?” at the Directors Guild of America’s 2007 Digital Day event. Robert Rosen, Dean of the UCLA School of Theater, Film, and Television and chair of The Film Foundation’s Archivists Advisory Council moderated the discussion about digital preservation issues facing the industry today. Panelists included filmmaker McG; Schawn Belston from Twentieth Century Fox; Phil Feiner, post production executive and technologist; Michael Pogorzelski from the Academy Film Archive, and Bob Yacenda from IBM. Among the topics covered were: What should be preserved -- both in terms of projects shot on film and projects that are born digital; which format is best for preservation masters, who should be responsible for preservation masters; and the future of preservation. PICTURE: TFF Digital Preservation panelists: Phil Feiner, Bob Yacenda, Schawn Belston, Robert Rosen, Michael Pogorzelski, McG.